The turn of the century NY Giants were not yet the Championship Dynasty they would become during the decade. In 1900 they were an an 8th place team, with some colorful characters & legendary players, forgotten in time. 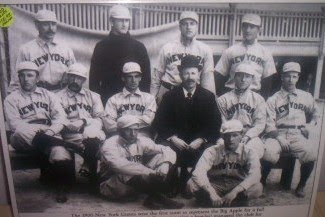 John McGraw wouldn't arrive as manager until late in the 1902 season. 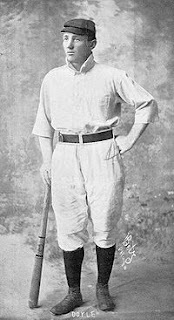 In 1900 Buck Ewing started the season as manager. He was considered the greatest catcher of his time and is a member of the Hall of Fame, but after a 21-41 start as manager he was fired. His replacement was George Davis who improved the team to play just above .500 (39-37). In 1901 he was fired after going 52-85 & finishing in seventh place. Davis was a good clean player, unlike most of his time. In April of 1900 Davis & team mates Kid Gleason & Mike Grady stumbled upon a raging tenement building fire. They ran into the burning building, Davis rescued two women and a child from the blaze. Afterward he humbly said, "I didn't do much. I just went up the ladder the same as the rest of the boys and helped to carry down women and children." His face was blistered from the heat, but he played in that nights game anyway. The 1900 pitching staff had a young rookie named Christy Mathewson who would go on to be one of the greatest pitchers of all time. (373 wins 3rd All Time- 2.13 ERA 8th all time) But in his first season he was 0-3 pitching in only six games, giving up 32 runs in 33 innings, with a 5.08 ERA. The ace of the staff was Bill Carrick who won 19 games, the problem was he lost 22 games. He pitched an incredible 341 innings pitched, giving up 415 hits while only walking 92 batters (3.53 ERA). The #2 man had a great name, Pink Hawley. He went 18-18, leading the league with 34 complete games. Four years earlier in 1895 he pitched a league leading 444 innings. Win Mercer was a handsome young bachelor who was very popular with the ladies. He was third in the rotation going 13-17, with a 3.86 ERA. He still holds the record for most stolen bases by a pitcher in a single season with nine. Mercer is 77th all time with 251 complete games. In the early days of the twentieth century, the Polo Grounds had specific day games for women called Ladies Days. 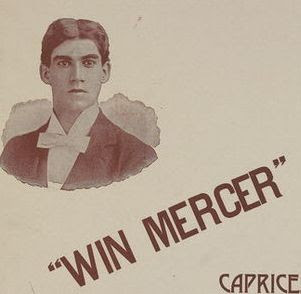 In 1897 t he popular ladies man Mercer, was ejected from a Ladies Day game. The women were furious, many of them had come just to see him play. A mob of ladies swarmed onto the field and began to beat the umpire. His clothes were ripped & he fell to the ground. The police had to break it up. It's whats known as The Ladies Day Riot of 1897. Sadly Mercer committed suicide two years later in San Francisco. Reports differ, some say he owed alot of gambling debts, he could never pay back, others say it was due to a woman. Another legend from the '00 squad was a deaf rookie pitcher named Dummy Taylor. Taylor who couldn't speak is credited for starting the use of signals to communicate with team mates on the field. Dummy led the league with 27 losses in 1901, but would have 3 straight 16 plus win seasons from 1904-1907. In 1904 he was 21-15, third behind Mathewson & Iron Joe McGinnity who both won over 30 games for the champion Giants. Taylor was 116-106 lifetime with a 2.75 ERA. After baseball he went on to teach deaf education in Kansas, living until 82 years of age. 1900 was the so called Dead Ball Era, the Giants leader in HRs w as Charlie 'Piano Legs" Hickman who hit nine. Most of Piano Legs' HRs were inside the parkers, he also led the team with 91 RBIs and hit 91 career triples. With so few HRs, running was a big part of the game back then. The Giants' thick mustached George Van Haltren, led the league with 45 stolen bases. Every starter on the team had at least 10 steals with five of them stealing over 20. The '00 Giants had four .300 hitters led by right fielder Kip Selbach who posted career-highs with a .337 average, & 176 hits. He also scored 98 runs & stole 36 bases. Dirty Jack Doyle, was teams Captain. In'00 he stole 34 bases, batting .267 driving in 66 runs. Doyle was an Irish immigrant who attended nearby Fordham University. Known as Dirty Jack, because he fought with everyone; umpires, fans, team mates & epically with John McGraw. He & McGraw were teammates in Baltimore, and they hated each other. 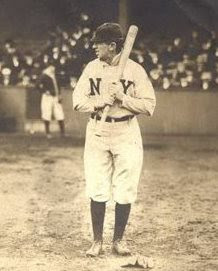 When McGraw was named manager in 1902, he cut Doyle, even though he was hitting over .300. Dirty Jack once slugged an ump who called him out on a stolen base attempt. A riot broke out as fans jumped onto the field and joined in. The police had to intervene & arrested Doyle. Another incident occurred at the Polo Grounds in 1900 when a fan was harassing him. He jumped into the stands and beat him up re injuring his hand. Strangely after baseball Doyle became e a Police Captain in Holyoke Mass., a baseball umpire (1911) and a highly respected scout for the Cubs. The Giants second baseman was Kid Gleason, from Camden, New Jersey. He only hit .248, but went down in history as manager of the 1919 Chicago Black Sox, who were accused of throwing the World Series. Quite a cast of characters indeed, oh the Giants of yester year.